**Please visit www.transcendusa.com/Support/Warranty.asp to view the complete Transcend Warranty Policy. Products Robust durability doesn’t always have to come at the expense of style. The StoreJet 25A2 offers an impressive level of anti-shock protection without sacrificing its slender good looks. 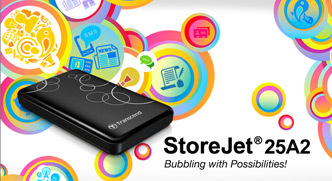 With capacity up to one terabyte and a convenient One Touch Auto- Backup button, your storage possibilities are endless!